Theresa’s husband is totally blind. Many family members are also blind or visually impaired. In the 39 years they’ve been together, Theresa has taken an active role in the blind community as reader, tutor, driver, sighted guide, and technology consultant. Theresa has degrees in Computer Science and IT Management, with expertise in software and business process design. She is an experienced teacher, and leverages that experience raising awareness of issues for people with disabilities, educating and advocating for improved access and increased independence. Theresa and her husband have developed and taught several courses on software accessibility, including web sites. Professionally, Theresa has worked in various IT-related roles, mostly in and around government agencies. For 8 years, she served as an officer in her agency’s Affirmative Action Advisory Committee, devoting much effort to improving employment opportunities and working conditions for people with disabilities in Wisconsin state government. Jobs and transportation are the two most critical issues for most people with disabilities, and particularly the blind. 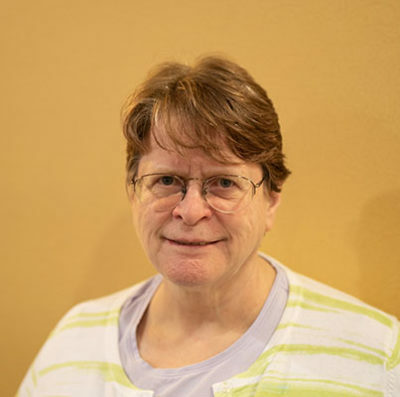 With her husband, Theresa has been a major supporter of the Wisconsin Council of the Blind & Visually Impaired, the Alumni Association of the Wisconsin School for the Visually Handicapped, and other organizations that work to create equal employment opportunity and public transportation options. Theresa was elected to the Board in December 2016.